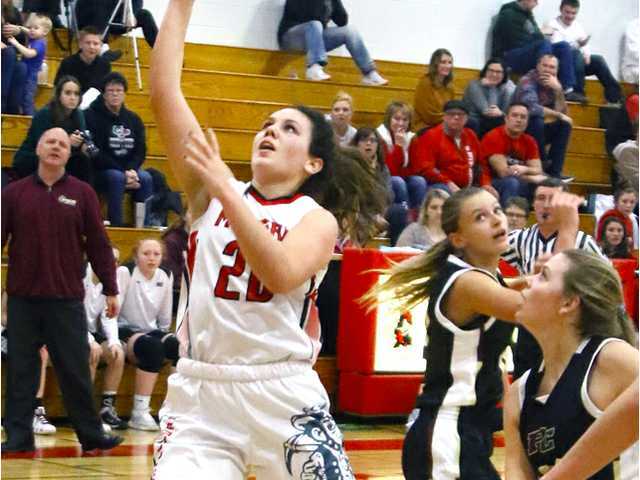 Shullsburg sophomore Layla Alt scored a career-high 30 points and pulled down 11 rebounds in a 71–45 win over #7 Wauzeka–Steuben last Friday night. POSTED February 14, 2019 1:58 p.m.
Shullsburg sophomore Layla Alt helped the Lady Miners post a 3–1 record in four games played against ranked Division 5 teams over the past week. Alt is this week’s Mast Water Technology SWNews4U.com Athlete of the Week. Alt had a monster game in Shullsburg’s 71–45 non-conference victory over #7-ranked Wauzeka–Steuben Monday night, tallying a career-high 30 points and pulling down a team-high 11 rebounds for her eighth double-double of the season. She also led the team with six assists, six steals and a blocked shot in the game. Alt also tallied a double-double with 12 points and 10 assists to go along with a team-high five steals in a 50–39 win over new D5 #10-ranked Kickapoo on Saturday and and she scored a team-high 15 points in a 64-58 win on Monday, Feb. 4, over Argyle, which was ranked #10 in D5 at the time. Shullsburg lone setback in the past week was a 50–34 loss to #3 River Ridge last Friday night. Alt finished with seven points in the loss. The Miners (10–9, 5–3 SRW) received the #6-seed in their WIAA Division 5 regional and will host #11-seed Seneca (7–10) in a regional quarterfinal Tuesday night. Butler went over the 1,000-point mark for her career last week in a 46–16 win at Barneveld. Despite a valiant effort by Barneveld to prevent her from getting the points she needed to top the mark, Butler reached the milestone by scoring seven of her nine points in the second half to helpd the top-ranked Warriors (16–0, 10–0 SRE) clinch the Six Rivers East title. Butler is the sixth player in program history and the 11th player in school history — girl and boy — to top the 1,000-point mark. She also becomes the third member of her family to do it joining older sister, Paige (1,094), and older brother, Heath (1,367), to do it at Black Hawk. Monson scored a career-high 20 points to lead the Hornets (12–8, 6–3 SWC) to a 61–45 SWC victory over visiting, shorthanded Platteville (15–4, 7–2) Saturday night in a makeup league game. Monson’s big night helped Richland Center end a streak of eight straight losses to the Hillmen that dated back to January 2016. Monson scored 10 points a night earlier in a 52–32 win over River Valley. Olson hit five 3-pointers and finished with a game-high 25 points, seven rebounds and six assists in the Cubans' 62-58 victory at Fennimore Monday night. Olson scored a team-high 14 points in Saturday's 55–47 non-conference win over Poynette Saturday at JustAGame Fieldhouse in Wisconsin Dells. The Cubans are now 13–6 overall and 7–4 in the SWAL. Post scored a career-high 28 points, grabbed a game-high 10 rebounds and snatched six steals to lead the Potosi/Cassville girls to a dominating 69–28 victory over Benton Friday night at Cassville High School. This was her second straight game scoring a career-high. Post finished with a game-high 18 points and six rebounds in the Chieftains’ 73–36 win at Juda last Monday night. Potosi/Cassville is currently 11–6 overall and second place in the SRW at 5–2. Rieken became the fourth player in program history to score 1,000 career points when he poured in a game-high 26 points in the Wildcats’ 70–38 victory over visiting Iowa–Grant Saturday night. Rieken joined Glen Stangl, Mike Lambe and Brandon Temperly as the only other milestone players. River Ridge junior Skylar White made history last Friday night in a 50-34 Six Rivers West conference victory over visiting Shullsburg. White became only the third girl in River Ridge school history to reach the 1,000-point career mark, and the first to do it in her junior season. Coming into Friday night’s game, White needed 19 points to reach the milestone and join the likes of Bridgett Myers and Stephanie Nemitz. She scored a team-high 26 points, bringing her season average to 20.5 points per contest for the third-ranked Timberwolves (16–2, 10–0 SRW).